Papercraft de un piano de cola - Manualidades a Raudales. Maqueta recortable de un piano de cola. Maqueta recortable de un magnífico piano de cola, la realización de esta maqueta es bastante complicada por la cantidad de piezas que la completan, podéis ver y descargar gratis una amplia colección de maquetas de instrumentos musicales haciendo clik Aquí. Esperamos que la completéis. Piano de Cola / Grand Piano. 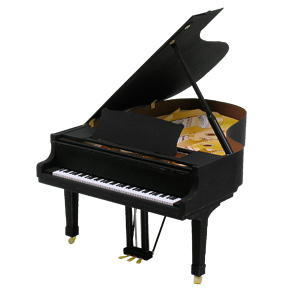 Papercraft de un Piano de Cola / Grand Piano. In grand pianos, the frame and strings are horizontal, with the strings extending away from the keyboard. The action lies beneath the strings, and uses gravity as its means of return to a state of rest. There are many sizes of grand piano. A rough generalization distinguishes the concert grand (between 2.2 and 3 meters long, about 7–10 feet) from the parlor grand or boudoir grand (1.7 to 2.2 meters long, about 6–7 feet) and the smaller baby grand (around 1.5 metres (5 feet)). All else being equal, longer pianos with longer strings have larger, richer sound and lower inharmonicity of the strings. Inharmonicity is the degree to which the frequencies of overtones (known as partials or harmonics) sound sharp relative to whole multiples of the fundamental frequency. This results from the piano’s considerable string stiffness; as a struck string decays its harmonics vibrate, not from their termination, but from a point very slightly toward the center (or more flexible part) of the string. The higher the partial, the further sharp it runs. Pianos with shorter and thicker string (i.e., small pianos with short string scales) have more inharmonicity. The greater the inharmonicity, the more the ear perceives it as harshness of tone. Wikipedia and http://cp.c-ij.com/.